My kids have been obsessed with learning about the life cycle of a frog. We have read lots of books about frogs and even tried to find a way to raise our own tadpoles. 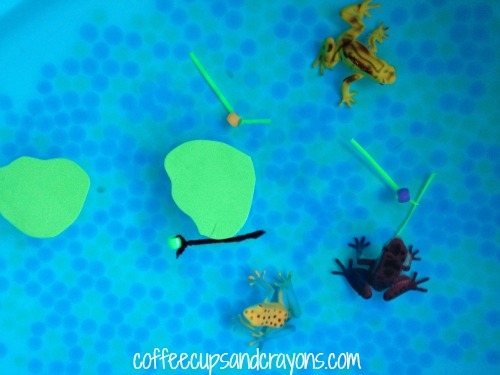 That didn’t work out so we decided to create our own small world Frog Life Cycle Sensory Bin! 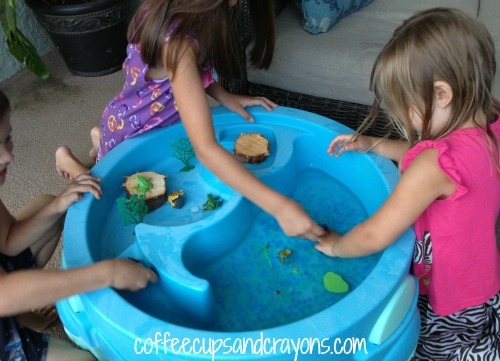 The kids love it and have been having a blast playing with the frogspawn, tadpoles, and frogs! To make the sensory bin we searched to see what we could find around the house for our frog pond. and a dry land section where the frogs lived! I loved to see how much about the frog life cycle they remembered from our library books! As soon as they saw some of the colored frogs they exclaimed they were poisonous. 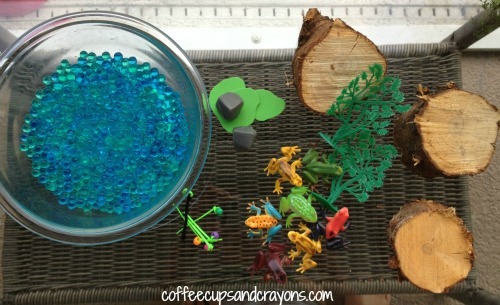 They have spent hours playing together with the frog life cycle small world sensory bin. I’d definitely recommend making one, especially if you can’t find tadpoles in your area! I love this idea! We have a water table that mostly gets ignored. I think this will encourage the boys to take a second look at it!! It is the perfect container for all three of mine to play around together, I should have been using it more too! Fantastic article – great ideas! We have tadpoles in our pond at the moment and my wee girl, age 2 and a half has been trying to understand the life cycle. Think I confused her a bit by referring to the Very Hungry Caterpillar and she now expects the tadpoles to turn into butterflies! 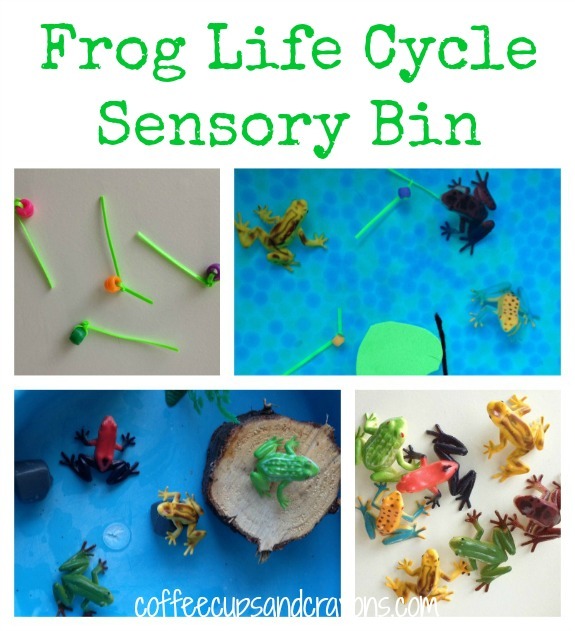 I maybe need a life cycle sensory bin like you have! Love your blog! 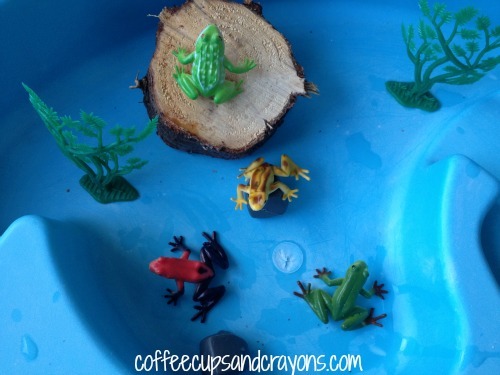 I saw the pond sensory bin on the Play Group and tweaked it for the frog life cycle. Now you post this! Awesome! I already planned to do a mini lesson in my son’s 3’s class and my other son’s 4’s class. I found frog life cycle models (eggs, tadpole, 2 legs, frog)on amazon for$8.00. Steph that’s awesome! I’ll have to check it out!